Sacramento, California, November 11-12, 2011 - Forty five parishioners traveled six hours by bus from Mary Star of the Sea Catholic Church in Oxnard, to the National Shrine of Our Lady of Guadalupe in Sacramento, California to pray before the tomb of the Servant of God, Bishop Alfonso Gallegos. While in Sacramento, they also visited the Cathedral of the Blessed Sacrament, Bishop Alfonso Gallegos Plaza, The State Capitol Building, Historic Sacramento and the group saw an exposition of the Holy Shroud of Turin. They were accompanied by Fr. Frank Wilder and Fr. Eliseo González. This pilgrimage was one of faith and joy as witnessed by the joyful singing practically the entire trip home from Sacramento. The pilgrims with Fr. Frank Wilder, OAR and Fr. Eliseo González, OAR. The General Council and the Provincials of the Order of Augustinian Recollects held a meeting in Rome from the 8th to the 12th of November 2011, in which they took two far-reaching decisions: to promote the project of renewal and the new responsibility of the General Curia on the novitiates, naming the formation teams and defining the common formative programs during the obligatory year of initiation to the Augustinian Recollect religious life. Fr. Francisco Sandoval, oar and Frater Jorge Valdivia, oar, were invited to a special mass for vocations and religious held at Newark Cathedral by his Eminence John Jay Myers, Archbishop of Newark. Hundreds of religious both men and women were represented at the beautiful ceremony. More were expected but because it was a day after one of the worst snow storms to date struck the Northeast, some were absent. Nevertheless, the attendance was very impressive and those present were very fervent as they all processed with his eminence the archbishop. Afterwards, they all went to the Archdiocesan center across the street to join for a light meal and to share with the other religious and any young person interested in knowing more about a particular religious community. May our faithfulness to our way of life attract many young men to answer the call to serve the Good Lord in his Church. Brother Jorge Mateos joined another 14 classmates from Immaculate Conception Seminary in Seton Hall University on Sunday October 23, in receiving the ministry of acolyte. The Most Reverend Arthur J. Serratelli, S.S.L., S.T.D., Bishop of Paterson New Jersey officiated a beautiful ceremony were he reminded the new alcolytes to be faithful to the Church, to be one with their community and to obey their superiors as a sure way to be a holy minister of God. The whole Tagaste Community was present to support him and congratulate him on his new achievement on his journey to the sacred order of the priesthood. Way to go Frater Jorge Mateos!! Three members of the parish of Cristo Rey were recognized for their contributions to the parish during a special Mass celebrated at the Cathedral of Our Lady of the Angels on October 16. Thre three members of the parish recognized for their service to the Church and parish were Rogelio Acevedo, Kimberly Arroyo and Eric Estrada. Each one of them have been active participants, with their parents, in a variety of parochial ministries and activities. The young people were recognized for the on-going commitment to serve as peer leaders for the Confirmation program here, assistants during the weekly progams of instruction and each of them are valuable assets to the retreat experiences for students in both years of Confirmation preparation. Each parish of the Archdiocese of Los Angeles had received the invitation from the Office of Religious Education and Youth Ministry to nominate up to four individuals for recognition. The three members from Cristo Rey were among a total of 493 young adults recognized during the Mass for continuing to be messengers of the Gospel through their words and actions. 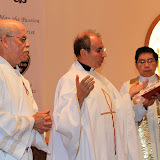 Archbishop Jose Gomez and Fr. Michael Stechmann with young adults from Cristo Rey Chruch, Los Angeles, who were award recipients. English Translation of "Religiosas Familias"